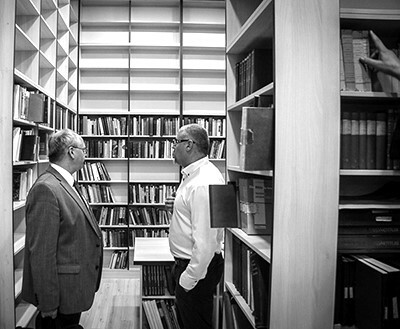 To establish a biblical library which will be at disposal of our postgraduate community and members of the department for pursuit of their scholarly projects. With the donation of Ulrich Luz and a number of further but smaller contingents of books, the institute now possesses a strong core of a research library. The second aim of our institute is to set up scholarly projects both at the national and international level of collaboration. An area of research which seems particularly inviting for such undertakings and for promotion of the orthodox work on the Bible is the reception history, that it to say, patristic and liturgical reception of Scripture. Thirdly, this institute is a crossroad of interdisciplinary avenues of research at which a number of disciplines represented at the University of Belgrade meet. Fourthly, the institute has a direct pedagogical aim. This is to assist our teachers of orthodox religious education in the use of the Bible in the classroom practice. Another field is the pastoral service. In order to involve the results of the biblical studies in the pastoral life of our Church, the biblical institute will regularly organize the seminars for the priests. Fifthly and finally, to provide an impetus for publishing activities focusing on translations of the seminal titles from the field of the biblical studies, but also of the outputs of contemporary Serbian authors in the same field. Further publishing plans include establishment of a series solely dedicated to the doctoral dissertations in the biblical studies, and a scholarly annual journal of the Biblical Institute in Belgrade.